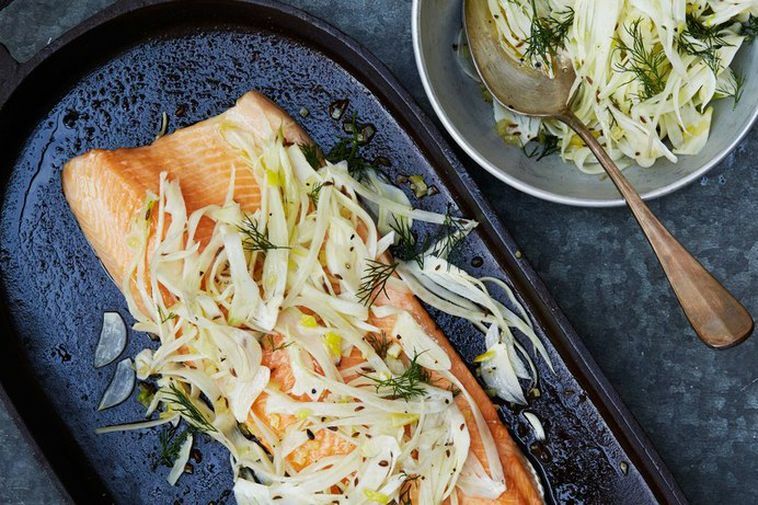 It's been raining all weekend but this elegant fish dish, made with healthy trout or salmon, will bring a ray of sunshine into your day. The mixture of fennel, dill and garlic provides a subtle and perfumed aroma to perfect the flavour of the orange coloured fish meat. The recipe is taken from the food section of mbl.is, Matur. Preheat the oven to 150 degrees C. Put the vinegar, sugar, cumin seeds, 2 teaspoons salt and 180 ml of water into a small saucepan until the sugar has been diluted. Take from stove and add garlic, let it sit until the garlic is soft, for around 100- 15 minutes. Put half of the fennel and stir into the saucepan. Wait until fennel is soft, for around 8 - 10 minutes. Put the fish into an oven dish and baste with oil. Season with salt and pepper. Bake until the fish turns a light pink and seperates easily, for around 15- 18 minutes. Pour the liquid from the saucepan into a bowl and add the lemon juice, zest, oil, dill and remaining fennel. Serve with the fish.